Secluded Getaway Close to the Plaza! Casa la Gordita is an impeccable, historic adobe in the heart of the Eastside. This three bedroom three bathroom sanctuary is completely renovated and beautifully furnished, offering total privacy and serenity behind twelve foot walls. The property consists of a main house with two bedrooms and two bathrooms and a detached guest houses offering one bedroom and one bathroom, in an exclusive garden setting. Amenities include four fireplaces, radiant brick floor heating, evaporative cooling, Tempurpedic mattress in the master bedroom, Bose sound system, European and South American antiques, and a private patio outside the master bedroom and walking distance to Canyon Road, the downtown historic Plaza and the local coffee shop and bookstore. The home sleeps six comfortably with a king size bed in the master bedroom, two twin beds (can convert to a king) in the guest bedroom and a queen size bed in the detached guest house. There is evaporative cooling in the main house and guest house. There are his and her walk-in closets ensuring comfort for longer stays. The home is beautifully landscaped with an antique stone fountain in the courtyard, mature trees, and flower beds. The patio is a perfect place to dine outdoors and enjoy the BBQ and fireplace. The home offers high speed internet, DVD, a classical CD collection, books and games. An electric gate opens to two off street parking spaces and there is one additional parking space located in front of the house along the street. 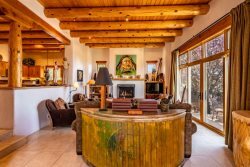 Casa la Gordita is walking distance to Canyon Road and to the downtown Santa Fe Plaza. The home is non smoking. No pets please without owner approval, thank you. Approximately 2,400 net square feet. The staff was so friendly! Lynn checked us in and took extra time to find out about the ski slopes and restaurants for us after we asked about those two things in particular. We accidentally set the alarm off in our house and even though I am sure she had shown us where the code was upon check in...she was happy to explain on the phone how to turn the alarm off and wasn't irritated at all by our mistake! She was awesome! Love La Gordita....highly recommend this beautiful home! And loved Casas de Santa Fe...we knew they were there for us if we needed them. Casas de Santa Fe has a wonderful website and staff. Todd could not have been any friendlier or responsive to my questions and the description of various properties we were considering. The property we ultimately chose was just perfect. The grounds were beautiful and the home was very well appointed! We loved the furnishings, art and the collection of great books in all the book cases. The beds were super comfortable and we loved lighting fires in our Kiva's. The property was in a great location to be able to walk to both the Plaza and Canyon Road. Thank you Todd!